The Sunbeds (Regulation) Act 2010, came into force on the 8 April 2011 to help protect the most vulnerable by stopping under 18s from accessing sunbeds. The Sunbed Hire Directory is fully supportive of this legislation and was already promoting the refusal of hire sunbeds to Under 18's before the legislation was introduced. Any business that supplies a sunbed for hire to a consumer needs to ensure they supply adequate instructions on the safe use of such equipment. The instructions would need to detail how to safely use the equipment, harm that can be caused from excessive use, that under 18's should not use the equipment and also that the equipment needs to be appropriately marked with warnings. In addition to this Sunbed Hire operators must ensure compliance with The European Standard (The General Product Safety Regulations 2005. BS EN 60335-2-27: Particular requirements for appliances for skin exposure to ultraviolet and infrared radiation) in which safe limits for UV radiance are stated, specifies a limit of 0.3 W/m2. Well what does this mean ? 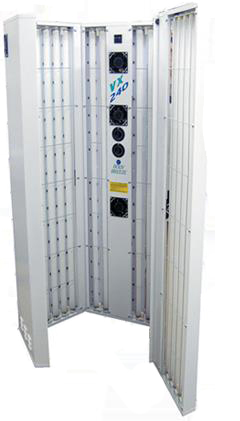 Well essentially the regulations state that the 0.3 W/m2 maximum irradiance limit for UV tanning equipment is based on the opinion of the EU's Scientific Committee on Consumer Products (SCCP), and as a comparison it represents the intensity of the midday sun in the summer in the Mediterranean. In other words the safe limit is intended to match sunbed output to the maximum that human Caucasians have biologically evolved to deal with. Advertisers featured on this directory are independent business operators and have a duty to comply with any such legislation, which may be relevant to the operation of their business. The Sunbed Hire Directory accepts no liability for the failure of a sunbed hire business not complying with any such legislation and encourages consumers to check with their supplier prior to arranging the hire of sunbed equipment. Question: Is sunbed use dangerous? Answer: Sunbeds offer health benefits as well as some health hazards if not used sensibly. Before hiring a sunbed please take some time to read the information below. The four main elements we rely on for our lives and wellbeing are air, water, earth and sunlight. If we take any of these forces away, then quite simply, we would not exist! There would be no life without the sun - but life with too much sun may not be good either. UVC, UVB and UVA - are emitted by the sun. UVC rays, the most dangerous to the human system, are filtered out by the upper atmosphere but some UVB (which can cause sunburn and eye damage) and UVA, reach the earth's surface. The intensity depends on the angle of the sun - ie the geographical position, season and time of day. UV levels can increase by up to 50% between 11am and 1pm! UV is invisible. People outdoors are exposed to varying levels of UV and they are often unaware of the UV intensity. Unfortunately, warnings of sunburn often come too late. A survey in Denmark revealed that beach sunbathers exposed themselves for an average of three-and-a-half hours a day. Sunbed lamps simulate the sun and emit UVA and UVB but they go a stage further and control the output with a balance of UV to minimise the risk of burning and maximise the tanning. As we know - no-one controls the sun! 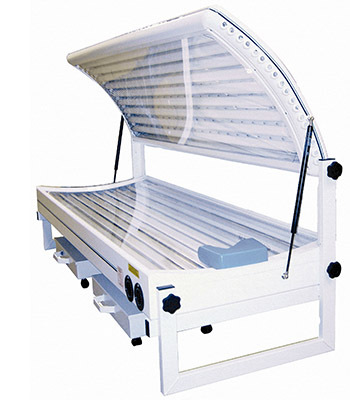 Sunbed lamp technology is subject to on-going research and development programmes to keep abreast of researched evidence on the effects of UV. Always remove make-up and cosmetics before tanning. Always remove jewellery to create that all over tan. If taking medicines always check whether they influence the light sensitivity of your skin. If in doubt, ask your doctor. Do not use sun-protection creams. Make sure the equipment is cleaned before tanning. Determine your skin type as this is the basis for your maximum exposure time. Set the exposure time on the sunbed for your skin type. Always observe the recommendations of the manufacturer and salon operator to avoid sunburn and get that perfect tan gradually. Always wear protective goggles or comparable eye protection when suntanning. Do not tan on a sunbed and in the natural sun on the same day. Do you always burn in natural sunlight? Do you have a medical condition that becomes worse in sunlight? Do you have an excessive amount of moles and/or freckles? Do you have a history of sunburn, particularly from childhood? Do you have skin cancer or does any member of your immediate family have/had skin cancer? Also, if you are on any medication or drugs, please check with your GP or pharmacist before using a sunbed as certain drugs make the skin more sensitive to UV light. If you are pregnant, consult your GP before use. So you've completed the above checklist and answered NO to all the questions and want to use a sunbed because looking good and feeling great is what having a tan is all about and why 70% of us in the UK want one! Whether it's an all-year-tan, a pre-holiday boost, vitamin D boost or you simply want to look good for that special occasion hiring a sunbed may be the solution.